This photograph shows the area behind my televison, as of a couple of weeks ago. I must confess that it has become a bit hairier since, with the addition of some new toys I intend to write about in the near future. 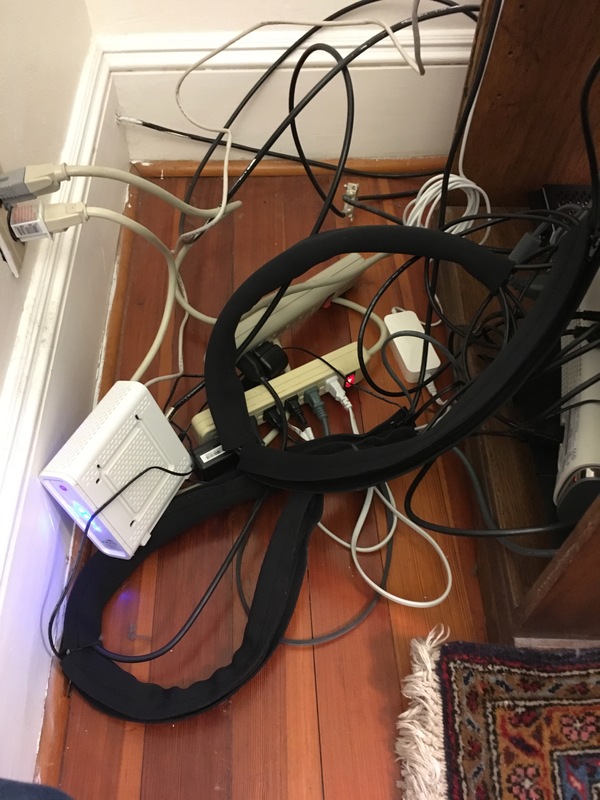 But I can also state that the depicted tangle has nothing on its prior state, before I applied those black, tube-shaped cable-bundlers you see snaking among the nest. I had purchased them last year, but didn’t figure out how to use them before this month. My key insight came when I realized I had to draw a map. I will get back to the map! First I will tell you about the tubes. They did not even look like tubes, at first. I purchased these things many months ago on Amazon, clicking the one-clicker on the search result for “cable organizer” that had the most obviously apparent intersection of high rating and low price, crossing my eyes such that all the other words and pictures would not trouble me. So when I found myself the owner of four black neoprene squares with zipper-halves along the edges and no documentation, I found myself confused and adrift. I put the squares into my desk drawer and forgot about them until last week, when I found myself alone at home for a few days, expecting the imminent arrival of yet more HDMI-leeching black boxes, and a freshly rediscovered resentment for the rat-king squatting behind my television. With fresh motivation, I poked around for some free-floating documentation, and found this video, which, though depicting a fancier accessory than that of my own purchase, makes clear the squares’ intended destiny of transformation into open-ended cylindrical sleeves. After grasping a fistful of cables into a sort of loose sheaf, one wraps one edge of the square around the bundle and then fastens it with the zipper, like a collar. This takes a modicum of manual dexterity, but I found it doable after a bit of practice. You then zip it shut, and find yourself with an overflowing cable-burrito. Then — and this is a subtle point I didn’t understand at first — you repeat the procedure on a different point along the sheaf you made, using another square. I find that, for a typical household A/V cable, two such meta-claddings along the cables’ length suffice to transform an unruly tangle into a still-twisty yet significantly rulier bundle, with a hydra-spray of plugs at either end. And since I owned four squares, that implied that I could create two of these monsters. But I still didn’t know quite where to start, and this then led to the map. On this map, each box represents a device in the vicinity of the television — including the TV itself — and each line a physical cable connecting two such devices. The special “⚡️” box, of couse, represents the overburdened and ungrounded power outlet found behind the TV, subject to both multi-tap power strips and three-to-two-prong adapters to allow electronics made within my lifetime to use this weatherbeaten New England home’s doddering sockets. This map revealed that the power cords represented, far and away, the strongest one-to-many relationship among my media-nest. So it came to pass that — after disassembling the whole thing — I rebuilt the stack of boxes such that their power sockets practiced sufficient mutual vicinity to receive the plugs from one end of a single eight-headed cable-monster, whose tail end spread semi-neatly into a pair of power strips. The second-most populated cable-destination, as shown on the map, was the HDMI switchbox (here labeled SWITCH), and so I repeated the procedure there. And in the end, I had reduced thirteen spaghetti-strands to two thick cable-sausages. While it still looks a bit of a terror back there — those sausages still resting in a bed of pasta, and all — I must once again assure you that the situation has proven so much easier to work with than before, enough so that I found myself quite able to wreck the whole new setup by adding a bunch more devices, threading their own cables into the newly opened lacunae. But at least I could! Time to buy a few more squares.